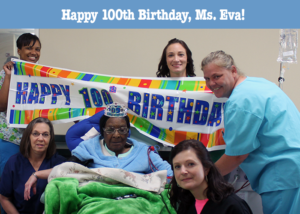 Dialysis Clinic, Inc. | Ms. Eva’s 100th Birthday! 03 Oct Ms. Eva’s 100th Birthday! The story shared below is done so with permission given by the patient. This story was provided by Joni Frey, social worker, at DCI Crowley. It is not every day that you meet a centurion, much less one on dialysis. For weeks we had been speaking to Ms. Eva about whether or not she was excited that she was about to be 100. Each and every time, she would just shrug her shoulders and say she hoped she made it, but that it was not up to her to decide that. Well, she did make it and we celebrated! She was a bit surprised, and grateful. And that is what Ms. Eva is all about – humbled gratitude. And telling it like it is. There has not been a day in the clinic that Ms. Eva did not tell us like it is and make us laugh. We will miss those bits of honest wisdom one day. But today was not that day. She said as a child growing up in the country, she would have to work around their home, bringing in the crops, before making the three-mile trip to school. She never took that little bit of education for granted. She loved growing up in the country, where life moved slower and you had to make the toys you played with. She said that is one thing that sticks out to her – that life moves too fast now. I asked if there was anything else she wanted to share and she said how she was thankful to God for all that she had, and for us, since “dialysis helped me make it to 100!” This sweet little lady has a heart and personality as big as the map which she has traveled across (she went to Jamaica at the age of 89!). Ms. Eva, you are a treasure and we are so grateful to have you with us!